About Fluid Power Solutions Inc.
At FPS we are focused on fluid power products and services, supporting forest products, mining, construction, oil and gas, agriculture, and more. We sell, service, and repair all major brands of industrial and mobile components and systems. Complete system design and installation capabilities. As a full line Parker Industrial and Mobile distributor we have the product to fit the application including valves, pumps, motors, cylinders, filters and more. 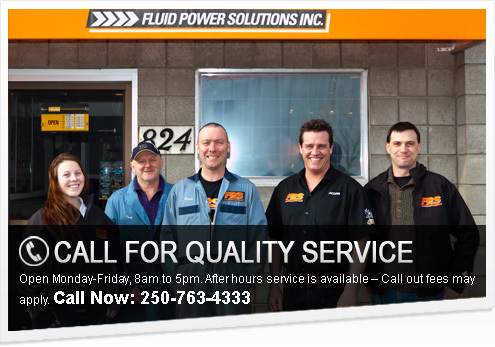 FPS specializes in servo and proportional valve repairs, and systems to customers across British Columbia. Our in-house capabilities include a wide selection of parts and experienced technicians, allowing us to provide truly industry leading service particularly for Bosch-Rexroth and Parker servo and proportional products. This includes sub-plate mounted, DIN, and sectional products and controls. We have a complete array of products to help our customers deal with contamination issues. As a full line Parker and Stauff distributor, we have the filter to fit your application; as well as, particle and moisture monitoring products to confirm your critical applications are within specifications. Call to discuss your application or get pricing on your next replacement element requirements. We provide repair of components, field service, and system design for lubricant dispensing such as pumps, hose reels and meters as well as automated systems for grease and oil including series progressive and Centrimatic type injectors. Authorized Graco/Trabon distributor and warranty repair center. As a full line Parker Connector distributor and Authorized Parker Store we are pleased to support walk in customers with replacement hose and fittings. We also support our customers with Vendor Managed Inventory solutions. We offer on-site and mobile hose and tube fabrication capabilities, as well as quick coupling, brass and industrial hose products. We offer a range of products including valves, filter-regulator, lubricators (FRL’s) and cylinders. FPS is a full line Curtis and Parker distributor. We provide in-house pump, motor, valve, and cylinder repair. We use original factory parts, not knock off import stuff and test to factory specifications to ensure the repair is done properly. We offer troubleshooting and field service as well, to get your plant or equipment back up and running. We provide new systems and upgrades to existing equipment for a range of applications including set works, hot press, drills, septic and vacuum trucks. Full turn-key solutions capable. We look at your specific requirements and help provide a true solution that fits your application and budgetary needs. We strive to maximise your productivity, reliability, and efficiency looking at the total system. We provide a range of installation and start up/commissioning services. This begins with the plumbing. We can help specify your requirements as well as supply and install pipe, tubing, and hoses with the required clamping and protective wrap as required. System flushing and testing to OEM cleanliness requirements to provide trouble free start up and ensure warranty of costly components is maintained. We provide customized on-site training solutions for industrial customers, particularly the wood products industry. Our extensive experience in this field allows us to offer practical hands on training for millwrights and electricians to expedite troubleshooting while ensuring root cause is identified and remedied. Course length and content varies please contact us for details.